Making his debut in Journey Into Mystery #83, Thor is the fabled Norse God of Thunder, in actuality a member of the Asgardian race, who live on another plane of existence from Earth. With the help of an enchanted hammer given him by his father, Odin, Thor can fly and control the weather. Although we've had this costume before, this is still new. 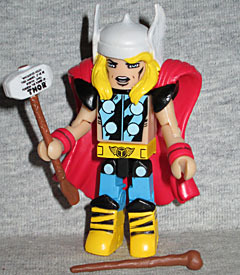 He has more hair, more detailed wings on the helmet, a bigger cape (with built-in shoulder pads), and is the first "classic Thor" Minimate to actually get all six chest discs - even the two below his belt. He gets new feet with new bootfronts, but the feet are the size of the original Minimate feet (not the smaller Lego-compatible ones we've been getting for years) so they look oversized. His Mjolnir has a smaller head and a super-long handle, and is printed with the "Whosoever..." spiel. He also comes with Donald Blake's cane, which is cool, but would be better if we had a Blake. Thor's friend and half-brother Balder is the Norse God of Light, and can generate intense light and heat. He also wields the sword Frey, which can fight on its own, and is somewhat protected from injury by a spell cast upon his birth. Following the death of Odin, Balder has become the new king of Asgard. In the real myths, Balder is the most traditionally heroic of the Norse gods - strong, invulnerable, pure, all that jazz - so it's fitting that this figure uses the same cape as the first Minimate Superman. 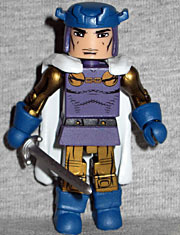 His costume - with its purple, blue and gold - looks very regal, and the stubby spikes on his hat are classic Kirby. He gets a short skirt with two small holes on either side of the belt buckle, and like Sif, he's armed with Swordsman's sword. 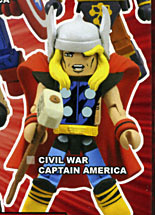 There's an amusing error on the packaging for this TRU-exclusive series: when the graphic designer was moving things around, they accidentally left the name for "Civil War Captain America" over the picture of First Appearance Thor. Whoops!